This video has been on YouTube for a few years now, but I just discovered it and I’m fascinated by it. I’m a child of the 1960’s. No, not a dope smoking hippie, but one of the millions of boys and young men who were absolutely fascinated and inspired by America’s early manned space program and the space race. I credit the space program with triggering my fascination with technology and science. Everything associated with the space program and NASA – space flight, rockets, engineering, the astronauts (most of whom were highly qualified military pilots and engineers – the best of the best), mission control, navigation, discipline, overcoming insurmountable challenges – it all served to inspire me as a child. I badly wanted to be a part of all of that and I knew one of the ways to get there was to focus hard on math and science. While I was an underachieving math student and a lot of science came hard to me (particularly chemistry – I never could balance an equation), I never lost my fascination with the idea of the subjects and today I’m more an evangelist for the role of math, science and engineering than a practitioner of it. This video demonstrates the wonderful meld of historical data and modern analysis and visualization techniques to answer a unique question – what were the circumstances that caused the ‘earthrise’ to appear in the Apollo 8 Command Module windows? Given the mission profile and the orientation of the Command Module (pointed straight down towards the lunar surface) the view should not have been available. It was the ‘aerial’ photos taken by the fixed reconnaissance camera that provided the clue. One of the things I like about the topographic sciences is that we often get to play history detective, using our unique skills to combine old data with new data to uncover new or unique perspectives. That’s precisely what happened here. The video shows it was the Command Module rotation, indicated by the shift in photo coverage, that allowed the rising earth to come into view. But where over the Moon did that rotation take place? 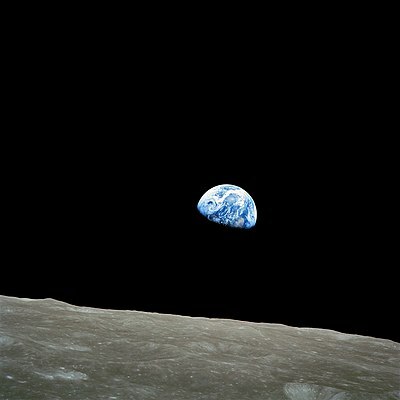 I was only after scientists at NASA were able to correlate (georeference) the Apollo 8 photos with current Lunar Reconaissance Orbiter (LRO) mapping data that they could precisely pinpoint the Command Module’s position over the Moon when the rotation occurred and the Earth came into view. What we get from this exercise is the ability to recreate the precise circumstances that allowed one of history’s most iconic photos to be taken. While this discovery won’t solve world hunger or bring warring factions to the peace table, it is a fascinating example of how we can meld old and new geospatial data to answer unique questions and open the door to our history. Another interesting blog entry, Brian……Thank you for taking the time to do it!